Turkish President tells Trump Turkey is ready to take over security in Syria’s Manbij as US withdraws troops. Turkish President Recep Tayyip Erdogan spoke to US President Donald Trump on Sunday and told him Turkey is ready to take over security in Syria’s Manbij, the Turkish presidency said, according to Reuters. Erdogan said an attack that left four Americans dead last week in Manbij was an act of provocation aimed at affecting Trump’s decision last month to withdraw US troops from Syria. The attack occurred nearly a month after Trump unexpectedly announced that he would withdraw all 2,000 US troops from Syria, declaring Islamic State (ISIS) had been defeated there. ISIS claimed responsibility for Wednesday’s attack. Manbij is controlled by US-backed Syrian Democratic Forces (SDF), a militia allied to the US-backed Kurdish YPG, which last month invited Syrian President Bashar Al-Assad into the area around the town to forestall a potential Turkish assault. The US makes a distinction between the YPG and the PKK, but Turkey does not and has more than once expressed its outrage over the American support for YPG, which it views as a terrorist organization. 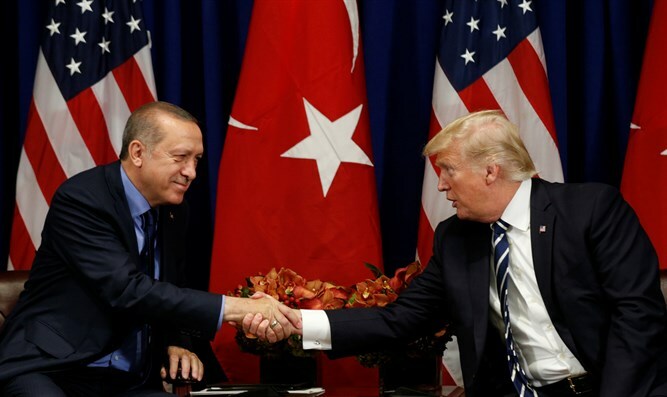 Erdogan and Trump agreed to accelerate and continue discussions between their chiefs of staff regarding a safe zone in the area, Sunday’s statement said. Last week, Trump threatened to “devastate Turkey economically” if it harms the Kurds after the US withdraws its troops from Syria. Erdogan’s spokesman, Ibrahim Kalin, later responded to Trump's threat in a tweet of his own. "Terrorists can’t be your partners & allies. Turkey expects the US to honor our strategic partnership and doesn’t want it to be shadowed by terrorist propaganda. There is no difference between DAESH, PKK, PYD and YPG. We will continue to fight against them all," he tweeted. A day later, Trump and Erdogan discussed the creation of a "security zone", the Turkish presidency said in a statement. Trump also noted the conversation with Erdogan in a post on Twitter. “Spoke w/ President Erdogan of Turkey to advise where we stand on all matters including our last two weeks of success in fighting the remnants of ISIS, and 20 mile safe zone. Also spoke about economic development between the U.S. & Turkey - great potential to substantially expand!” Trump wrote.